Human HSA,His Tag, low endotoxin (HSA-H522a) is expressed from human 293 cells (HEK293). It contains AA Asp 25 - Leu 609 (Accession # NP_000468). The protein has a calculated MW of 67.3 kDa. The protein migrates as 67-80 kDa under reducing (R) condition (SDS-PAGE) due to glycosylation. Human HSA,His Tag, low endotoxin on SDS-PAGE under reducing (R) condition. The gel was stained overnight with Coomassie Blue. The purity of the protein is greater than 95%. Immobilized Biotinylated Human FcRn Heterodimer Protein (SPR verified) (Cat. No. FCM-H82W4 ) on SA Chip can bind Human HSA,His Tag, low endotoxin (Cat. No. 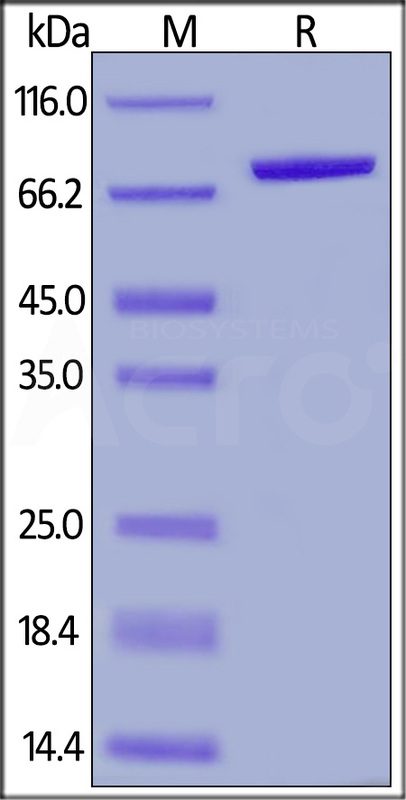 HSA-H522a) with an affinity constant of 1.46 μM as determined in a SPR assay (Biacore T200) (Routinely tested). Human serum albumin (HSA) is also known as ALB,which is the main protein of plasma and has a good binding capacity for water,Ca2+,Na+,K+,fatty acids,hormones, bilirubin and drugs.The main function of HSA is the regulation of the colloidal osmotic pressure of blood. As Major zinc transporter in plasma, HSA typically binds about 80% of all plasma zinc.A variant structure of albumin could lead to increased binding of zinc resulting in an asymptomatic augmentation of zinc concentration in the blood. Defects in serum albumin can cause familial dysalbuminemic hyperthyroxinemia which is a form of euthyroid hyperthyroxinemia that is due to increased affinity of serum albumin for T4.It is the most common cause of inherited euthyroid hyperthyroxinemia in Caucasian population. (1) Carter D.C., et al., 1989, Science 244:1195-1198. (2) Minchiotti L., et al., Eur. 2001, J. Biochem. 268:344-352. (3) Minchiotti L., et al., 1992, Biochim. Biophys. Acta 1119:232-238.